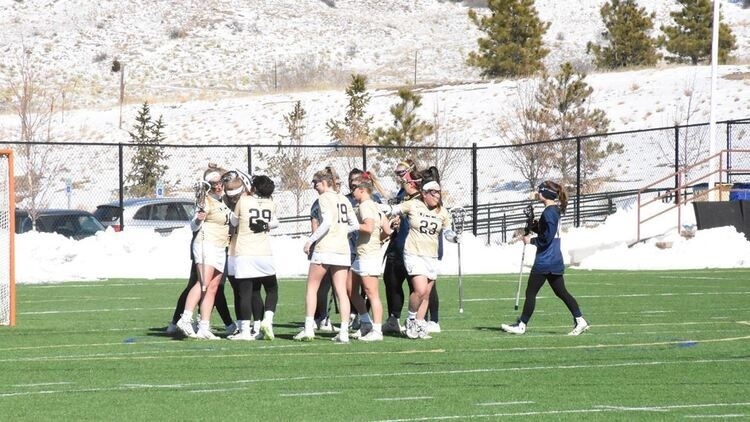 The University of Colorado Colorado Springs women's lacrosse team is getting set to take on two nationally ranked opponents this week against the No. 21 Colorado College Tigers and the No. 11 University of Tampa Spartans. The games will take place on Wednesday, Feb 27 at 3 p.m. at Colorado College, and Monday, March 4 at 3 p.m. at Mountain Lion Stadium. UCCS has started their season 1-1 in two home games, averaging 16 goals per game over those two contests. The Mountain Lions have scored 33 goals on 76 shots, giving them a shooting percentage of 44 percent in two games this year. They have also racked up 12 assists, giving them 45 points in two games, 29 draw control wins, and have caused 27 turnovers. Individually, Brianna Martinez, Vanessa Nelson, and Angela Naughton are leading the Mountain Lions, each totaling seven, six and six points so far this year respectively. Martinez has five goals to go along with two assists for her seven points, while Nelson has team leading six goals and 60 percent shooting percentage and Naughton has five goals and one assist. Natalie Church is leading the team in assists with four and draw control wins with eight. Goalkeeper Emma Becker is leading the team in saves with 10 in 67 minutes of play this season. UCCS suffered a tough loss to the No. 8 Regis University Rangers by a score of 9-18. The Mountain Lions attempted 21 shots in the game, 10 in the first half and 11 in the second half. After a slow first half of scoring only two goals, UCCS would score on seven of their 11 shots in the second half. Unfortunately, Regis lived up to their No. 8 national ranking, scoring on 18 of their 27 shot attempts. Six different Mountain Lions scored against Regis, with Naughton tallying a game high three goals and Brianna Martinez netting two of her own. Naughton and Martinez, along with junior Vanessa Nelson applied the offensive pressure on Regis, each recording six, four and three shots, respectively. Nelson also tallied a team high five draw controls in the game. Martinez and Kiera Lowe each had an assist in the game, giving them three and two points for the game. Colorado College is coming into the 2019 season with a pre-season ranking of No. 22 in the IWLCA Division III poll. The Tigers have yet to play a game this season, however they finished last season ranked No. 20 in the nation, posting a record of 15-5. The Tigers had four players named to the All-West Region team last year, including senior Steph Kelly who was also named a Second-Team All-American. Of the four players named to the All-West Region team, three were seniors and one was a sophomore. As a team, the Tigers averaged 15.5 goals on 36.8 shots per game last season and had a 42 percent shot percentage. They also had 149 assists, caused 236 turnovers, had 326 draw controls and a clear percentage of 77.6 percent. Freshman goalkeeper Alena Stern racked up 148 saves on the season last year and a 14-4 individual record. The University of Tampa came into the season ranked No. 19 in the IWLCA Pre-Season poll for Division II. After a 3-1 start, including a win over No. 11 Limestone, the Spartans are currently tied for the No. 11 spot in the IWLCA Division II poll. In four games this season, Tampa has 68 goals on 141 shot attempts, giving them a 48.2 percent shooting percentage and an average of 17 goals per game on the season. The Spartans are getting off around 35 shots per game, including a 78.7 percent shots on goal percentage. Statistically, Tampa also has 36 assists, 62 draw controls, 15 free position goals, and 39 caused turnovers as a team this year. Their goalkeepers have tallied 47 saves in four games as well. Carly Vaccaro and Maggie Gladden are leading the charge offensively, as they each have 19 and 16 points respectively so far this year. Vaccaro leads the team in goals with 15, shot percentage at 65 percent and has four assists on the year. Gladden is second of the team in goals with 13 and has three assists. Rachel Crawford leads the team in points thanks in large part to her team leading 15 assists to go along with five goals. Claire Swanson leads Tampa in draw controls with 35 and caused turnovers with seven. The forecast in Colorado Springs for Wednesday, Feb. 27 is slated to reach a high of 61 degrees with cloudy skies and winds up to 10 miles per hour. On Monday, March 4 against Tampa, the weather will be drastically colder, with a high of 28 degrees, snow showers, and winds up to 10 miles per hour. The Mountain Lions will be traveling to Shawnee, Okla. to take on RMAC opponent Oklahoma Baptist University on Saturday, Mar. 9. The game is scheduled to start at 11 a.m. (MT).